This modern vacation villa lies in a quiet area on the Atlantic coast, only a 10 min. drive from the sought-after seaside resort Cascais and 15 min. from the famous golf resort Quinta da Marinha. Villa Celesta compirses 3 floors. On the ground floor there is an open plan living/dining area and a fully equipped modern kitchen. Direct acces to terrace and pool from this area. Further on this floor: a double bedroom, a twin bedroom and a bathroom. On the first floor you will find the master bedroom with en suite bathroom and balcony. On the lower floor there are 2 double bedrooms with en suite bathroom and a games room with billiard table and table football. Access to the garden from this floor. The lovely pool (12 x 5) is surrounded by a large wooden terrace with 8 sun beds. The pool can be heated against a supplement. 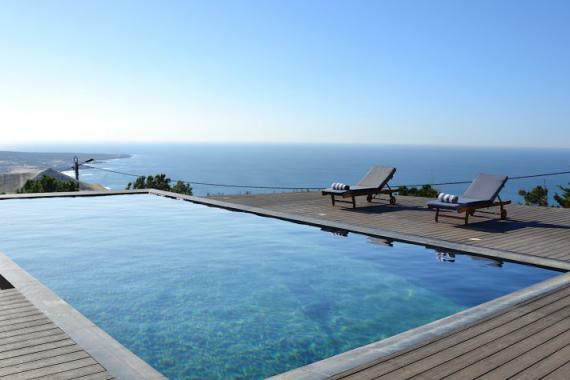 Villa Celesta is located on the Atlantic coast near Lisbon (Portugal) only a 10 min. drive from Cascais. Beach: 5 km. Sintra: 22 km. Shops, etc. : 4 km. Lisbon Airport: 40 km.